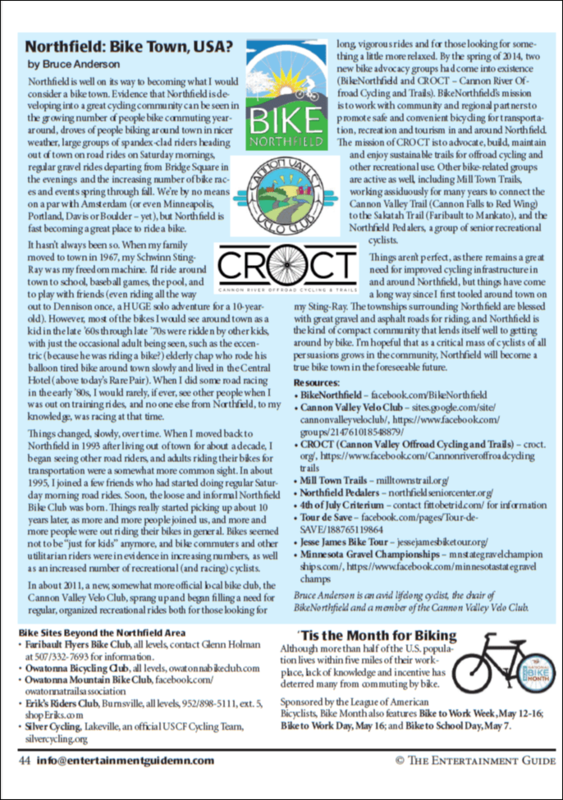 By the spring of 2014, two new bike advocacy groups had come into existence (BikeNorthfield and CROCT – Cannon River Offroad Cycling and Trails). BikeNorthfield’s mission is to work with community and regional partners to promote safe and convenient bicycling for transportation, recreation and tourism in and around Northfield. The mission of CROCT is to advocate, build, maintain and enjoy sustainable trails for offroad cycling and other recreational use. See the other bike-related articles in that issue, too: Non-Rules of the Gravel Road by Nathan Nelson and The Early Bicycling Craze by Susan Hvistendahl.